Copyright, 1891. by E. Clark Reed. Words and Music by Edgar Deering. Stretching away there before us, lies Gretchen's home by the sea. Nearer and nearer approaching, soon we will be with our love. Soon we will feel the heart beating, see the sweet face of my dove. 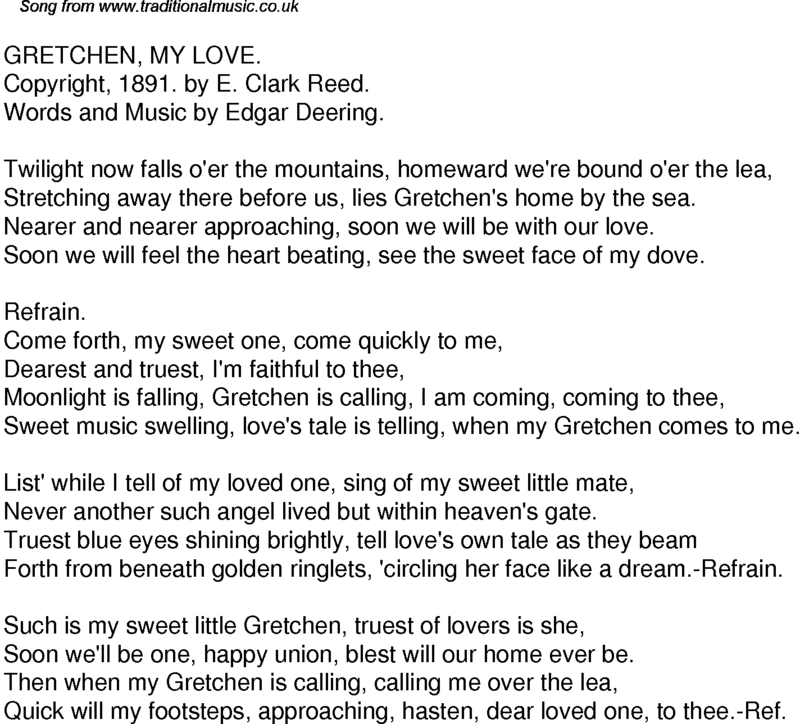 Sweet music swelling, love's tale is telling, when my Gretchen comes to me. Never another such angel lived but within heaven's gate. Forth from beneath golden ringlets, 'circling her face like a dream.-Refrain. Soon we'll be one, happy union, blest will our home ever be. Quick will my footsteps, approaching, hasten, dear loved one, to thee.-Ref.